Representing Marist Sisters of their Asia-Pacific region, the Plenary Regional Council meets at historic Villa Maria, Hunters Hill, Jul 27-31. 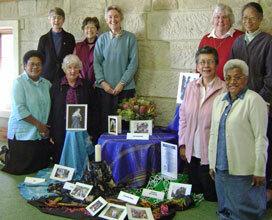 The group is reviewing and planning for the work of Sisters in Australia, Fiji, the Philippines, PNG and New Zealand. From left, standing: Srs Gail Reneker (Sector leader, Australia), Francine McGovern (Sector leader, NZ), Julie Brand (Regional leader), Margaret Cross (Regional bursar) & Veronica Lum (Sector leader, Philippines). Kneeling: Srs Mariana Tevurega (Sector leader, Fiji), Margaret Vaney and Anne Rounds (Regional Councillors), Rita Raikuna (General Councillor). Srs. Francine, Gail and Julie. in the grounds of Villa Maria. 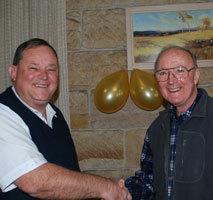 The web site of the New Zealand province of the Marist Fathers has a new look. Webmaster, Fr John Murphy SM, launched the revised site on Jul 27, featuring clean, modern lines, ease of navigation and features on Marist spirituality in addition to local and international Marist news. 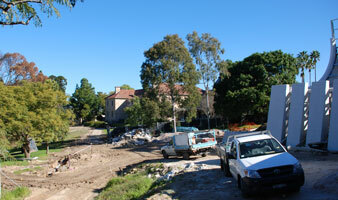 As part of its annual review of the Marist Fathers' life and work in Australia the Council of the Province checks on progress of the Montbel retirement facility at Hunters Hill. Montbel inspection, Jul 20. Members use the provincial office's refurbished meeting room. Family members joined Fr Tom Fulcher SM and his community of Villa Maria, Hunters Hill, on Jul 18 to celebrate fifty years of priestly life. 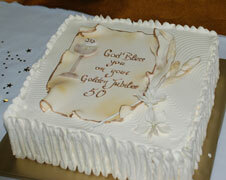 Fr Tom was one of thirty-two deacons ordained at St Mary's cathedral, Sydney, on Jul 18, 1959. Fr Tom with sister, Therese, and brother, John. then Fr Tom celebrates with family and Marist confreres. M.E. 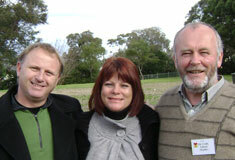 leadership teams representing Oceania and Pacific teams include two Kiwi Marists (see below). 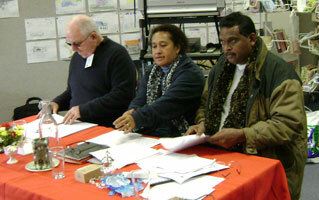 Fiji-based Eric & Ma Narayan & Fr Mike McVerry SM lead the Oceania region of Marriage Encounter. 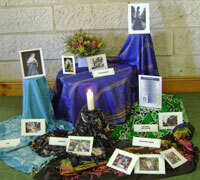 Marriage Encounter's annual Pacific meeting Jul 14-17 at Forestville, Sydney. Fr Carl Telford SM is part of the coordinating team for the Pacific countries of Australia, New Zealand and a number of Oceanian countries while Fr Mike McVerry SM shares in the leadership of the Oceania region. Both are New Zealanders. The first Marriage Encounter weekend in the Pacific was held in Sydney in February 1974, quickly spreading to all Australian states, New Zealand, Fiji, PNG, Tonga, Solomon Islands and other countries of Oceania. 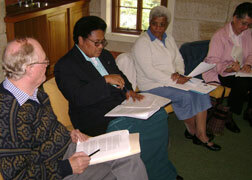 Leadership teams reflect the presentation method of the Worldwide Marriage Encounter weekend experience when sessions are led by 'ecclesial teams' of a married couple and priest. Sessions of M.E. 's Pacific meeting, July 14-17. 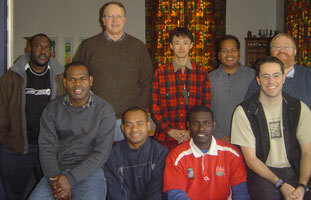 Japanese-born candidate for the Marist Fathers' Australian Province, Yoshitake Shiragami, has arrived at the Marist formation community in Auckland, NZ. After spending periods earlier this year in community experience and English language studies at Hunters Hill, Sydney, and Suzaku, Nara, Japan, Yoshi now commences formal seminary studies. The Auckland community provides for seminarians from Australia, New Zealand and Oceania Marist provinces under the leadership of its Australian rector, Fr Tony Kennedy SM. Back from left: Raymond Girana, Fr Pat Brophy, Yoshitake Shiragami, Sipiliano Faka’osi, Fr Tony Kennedy. 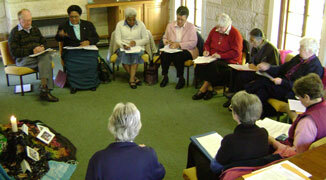 Inaugural meeting of the Social Justice group, Hunters Hill, Jul 07. Australian Marists are addressing contemporary issues of social justice following a provincial chapter decision to set up a Social Justice group. Noting the existing social justice ministries in the province, the new group (pictured left at its first meeting) has already begun planning fresh initiatives Australia-wide. 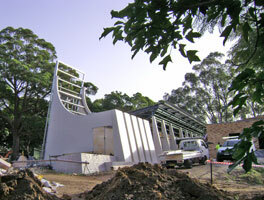 The distinctive profile of Montbel's chapel is a feature of the Hunters Hill site of new accommodation centre for senior Marist Fathers. 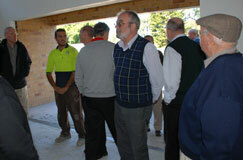 Work is also well advanced on the rooms which will house ten retirees. 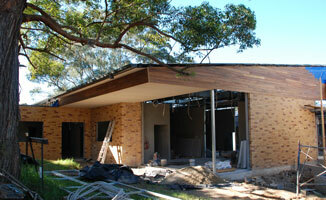 Target completion date is in November. 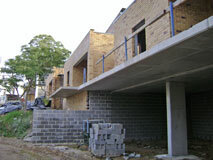 The new complex will have eight bedrooms with ensuites on the main floor with two self-contained compartments on the lower floor. Montbel residents will include some from the existing retirement residence of Maryvale. 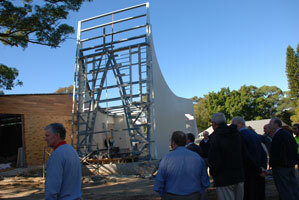 There will be several other Marists moving from other Marist communities. A single community will be formed in the Montbel-Maryvale environment. View shows the proximity of Montbel (chapel at right) to historic Villa Maria monastery (background).